I love to laugh. In my opinion, the funniest comedy is situational humour. As far as I’m concerned, there’s nothing funnier than everyday life. And there’s nothing better than having a good laugh, even and especially when I haven’t had the best of days. Today was a typical Monday. I couldn’t get to sleep last night and, when I did, I was woken at the crack of dawn when the guy who lives in the apartment overhead dropped something heavy onto the floor. Then, when I arrived at work, the code to the secondary entrance showed it was working but the door wouldn’t budge. Ever. And, when I got to the office I was working in today, I couldn’t log onto my computer. Everyone else’s computer was working but mine. After work, I had to find a government office in an area of the city that I’m not familiar with. I found the building way faster than I expected, only to discover that the office I was looking for had changed locations 3 1/2 years ago! I was given a list of four current office locations but things went from bad to worse when I became disoriented and headed due south instead of due north. I eventually realized my mistake, and switched direction, only to somehow overshoot my exit by a country mile. The result was that I ended up on a wild goose chase for well over 2 hours – all through rush hour traffic – and I never did find even one of the four offices. The best part? When one thing after another was going wrong, I chose to just roll with the punches, and stayed calm, cool, and collected. I don’t always handle days like this the way that I should but I am proud of how I handled things today. All I had to do was stay standing and, when the dust finally settled, I was still standing. It was a good feeling. I’m learning that I can’t change what happens to me but I can decide how I’m going to react to it. I can’t choose the first but I can totally choose the second. And it’s easier to potentially laugh at some of the things that go wrong if I don’t needlessly stress myself out about them in the first place. Nobody ever changed anything by worrying, and I’d be deluding myself if I thought I would be the first. So, what’s the perfect end to an imperfect day? 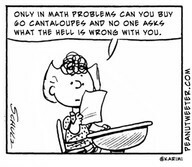 I love Peanuts, and so who better to give me a great laugh about a situation we can all identify with. Happy Monday everyone. I hope you have a terrific Tuesday!